Mary and I went with Zaffre to DOTY this past weekend. We enjoyed the day catching up with friends of long-standing, and meeting other friends who had disappeared from the scene some time ago. 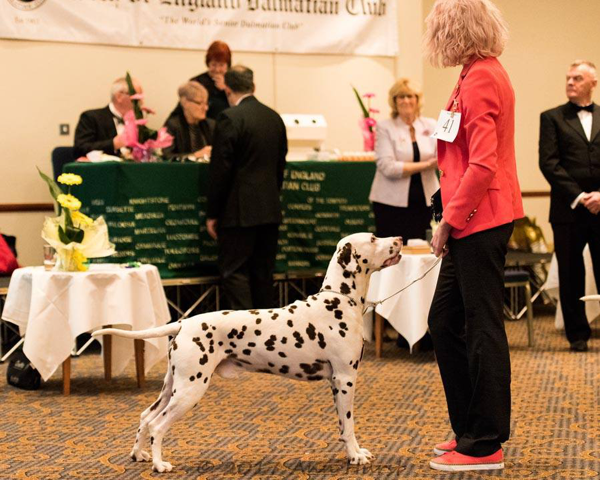 So it was a very good day at a show – a very special show for Tolutim because there were three Tolutim dalmatians there on the day. Tolutim Zaffre met an Irish Champion in the first round and bowed out. Tolutim Yves St Laurent at Judally also got knocked out in the first round. Tolutim Drambuie, however, had a wonderful day, becoming the first DOTY Veteran winner, receiving the Peggy Pilgrim Memorial Trophy. We understand the partying went on well into the night, with a meal and dancing after the juddging was over.